Are You a Candidate For Dental Implants near Oshkosh? If you’re missing one or more of your teeth, you understand the daily struggles it presents. You might feel self-conscious about speaking or smiling in front of other people, which could cause your personal and professional relationships to suffer. Eating, chewing and enjoying your food becomes a challenge, which can cause your diet and nutrition to suffer. You may not realize, but your oral health also suffers when you’re missing a tooth. Your healthy teeth may begin to shift, and your jawbone will begin to lose density without a replacement tooth. 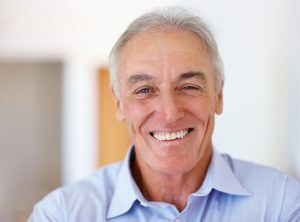 The good news is that dental implants may be the solution you’ve been looking for, but the question is, are you a candidate for dental implants near Oshkosh? A dental implant is comprised of a biocompatible titanium post to replace your root, and a porcelain crown to replace your tooth, and this is why implants are so successful. Because they replace both your root and tooth, they protect the integrity of your healthy remaining teeth and your bone. No other tooth replacement option can offer these benefits. Your new root will integrate with your bone over time, creating a stable foundation for your new crown. Your dentist will custom design your new crown to match your existing teeth, so it will naturally complement your smile and no one will ever know that you were missing a tooth. Dental implants are easy to care for, as you’ll be able to brush and floss your implant just like a natural tooth, and with excellent home care and regular dental check ups your implant can potentially last a lifetime. In order to be successful, dental implants do require that the patient be in good general health and have enough healthy bone structure to support the implant. If you’re considering dental implants, the best place to start is a consultation with your dental provider to determine if implants are right for you. At Silver Creek Dentistry, Dr. Cris Johnson and Dr. James Hamman specialize in helping patients restore their smiles with dental implants and other treatment options such as dental bridges, dentures and partials. With a thorough examination and x-rays our doctors can determine if implants are the best treatment option for you, and they can guide you through the treatment process from start to finish. Don’t let missing teeth affect your oral health or your life any longer! Contact our office today to learn more about how we can help restore your smile. Comments Off on Are You a Candidate For Dental Implants near Oshkosh?